Born in Cuba to a Catholic family, Genie Milgrom has brilliantly traced her maternal lineage back 600 years to the Jews of pre-Inquisition Portugal and Spain. In her first talk, she will present her amazing personal journey to uncover her Jewish origins. In her second talk, she will describe the Catholic, notarial and Inquisition records that led to her discovery and ultimately persuaded Rabbinic authorities to recognize her Jewish identity. 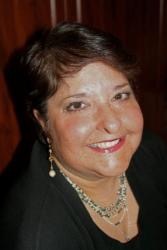 Genie Milgrom served as President of the Society for Crypto Judaic Studies at Colorado State University and as President of the JGS of Greater Miami. Her books, My 15 Grandmothers and How I Found My 15 Grandmothers, have won Latino Author Book Awards. She is an internationally acclaimed speaker. A book sale and signing will follow the lectures. Download or print out her slides.